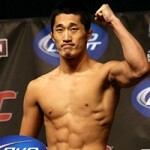 As a result of a knee injury suffered in training, undefeated Korean standout Dong Hyun “Stun Gun” Kim has been forced to withdraw from his UFC 110 bout with Chris “Lights Out” Lytle. A replacement opponent for Lytle on the inaugural Australian UFC card is expected to be announced soon. The bout between Kim and Lytle appeared to be an interesting clash of styles, as Kim’s technical striking and judo met with Lytle’s brawling. Lytle will no doubt hope that Kim’s replacement will be willing to stand and trade punches in search of another Fight of the Night honour. Lytle (27-17-5) has had more ups and downs in his career than most, but his penchant for engaging in all-out wars with opponents has endeared him to many and has also earned him many fight bonuses during his UFC career. Having never been finished in 49 career fights, save for two losses due to doctor stoppages from cuts, Lytle is easily one of the most durable fighters in all of mixed martial arts. Though his overall record is not the most impressive in the sport, Lytle has won five of his last eight bouts and has picked up solid victories over Paul Taylor and Kevin Burns during that time. Seemingly always just one step away from contender status, Lytle has faced his share of struggles in the UFC and has come up just short in a number of crucial bouts. Still expected to be a part of the debut UFC card in Australia, Lytle will once again aim to capture Fight of the Night honours when he looks to pick up his second straight victory. Win or lose, Lytle is a solid test for any opponent and is arguably the toughest gatekeeper in MMA. The extent of Kim’s knee injury was not revealed, but it is serious enough to keep him off of the February 21st card.